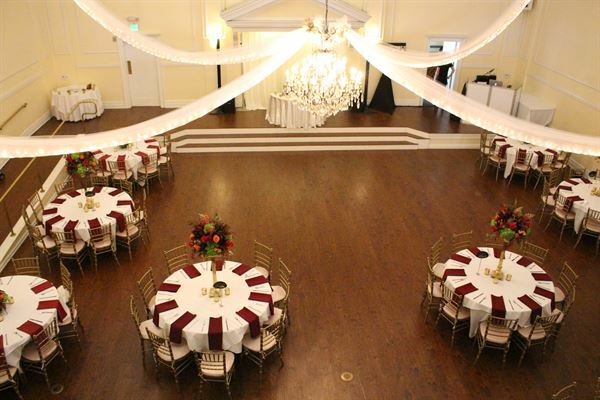 Located in the heart of Downtown Fullerton, Spring Field specializes in Wedding Ceremonies and Receptions, Birthday Parties, Quinceaneras, Company Parties, Corporate Meeting, Graduation Parties, and more. Please contact us directly. Spring Field is pleased to offer our new all-inclusive WEDDING PACKAGES for your special event. (This package may also be used for Quinceaneras and other formal dinner events). Our Wedding Packages include a variety of Hors Douvres, Menu and Dessert options. For non-Wedding events or Weddings on a budget, Spring Field offers a convenient Dinner Package option which allows you to pick and choose the essential items you would like for your event. After choosing one of our base packages, feel free to add on any of our Deluxe Amenities to make your event fun, elegant and truly unique. Luncheon and Breakfast Menus are available as well. Spring Field is pleased to offer a range of in-house bar services. Start by picking either a cash bar, or hosted bar. Get a cash bar and put in a tab so your guests can drink- when it runs out, they pay for additional drinks. All cash bars come with 5 hours of service. Or consider a hosted bar, with each adult 21+ bring served drinks for 4 hours. $500 deposit (most forms of payment accepted) and signed contact required to book any event. Non-refundable after 5 days from booking. $300 minimum monthly payments, non refundable. After booking, any date changes are subject to $500 fee. Remaining balance due two weeks before event (payable with cash, card, or business check- no personal checks). For birthdays, corporate parties, and everything in between, our Classic Dinner Package allows flexibility to fit your needs. Need appetizers as well? Add them on from our convenient upgrades section. Want us to take care of the dessert? We can do that, too, and much more! Ask us if you have any special requests. For a premium event, look no further than our Premium Dinner Package. Our plated dinner service brings an elegant feel to any affair. Add on appetizers or dessert and you'll be all set for your next gala, company party, or formal birthday party. Our Classic Wedding Package aims to cover a wide range of a bride's needs. With this package, we'll take care of the dinner, appetizers, dessert, wedding cake, and make sure your event looks beautiful with our chivari chairs and upgraded full length linens. With a full sit down dinner, tray passed appetizers, plated dessert, and custom wedding cake, this package is designed for the bride who wants a premium culinary experience for her wedding guests. With a customized menu crafted by one of Southern California's premier caterers, Colette's is sure to make any wedding stand out. Special Features: Spring Field prides itself on flexibility from guest minimums to packages modified to tailor fit your dream event.